This little baker appears to have things well in hand as she gently trims her pie crust. Luckily for us, there are somewhere between 3,000 and 4,000 designs created by Ellen H. Clapsaddle (1865-1934). She worked with the International Art Publishing Co. Ltd. of New York, who printed most of their cards in Germany. Collectors around the world prize her pieces and through the magic of the Internet, we are able to share a number of them here on Reusable Art. Like so many of Clapsaddle’s holiday postcards, this one features a charming child. Wearing a long brown dress with white cuffs and a white apron, our little Pilgrim friend is putting the finishing touched on a pie. She looks intently at her work as she cuts off a bit of the excess pie dough from around the edges. 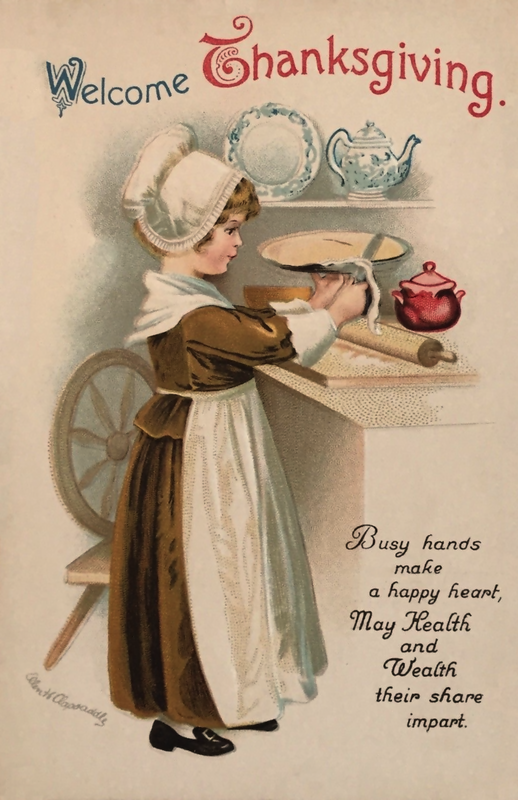 In the background we see her worktable, cutting board, rolling pin and a bright red pot. On the wall is a blue and white teapot and matching cake plate. Off to the side is a wooden spinning wheel. And, is it just me, or do the folds in her apron create a bit of a stalk of wheat image? A larger version of this vintage Thanksgiving Day postcard is available by simply clicking on the image shown above.